Dharmakīrti (fl. 7th century) wrote a treatise on the nature of the mindstream in his Substantiation of Other Mindstreams (Saṃtãnãntarasiddhi). According to Dharmakirti the mindstream was beginningless temporal sequence. 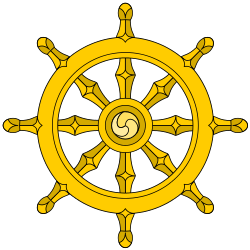 The notion of mindstream was further developed in Vajrayāna (tantric Buddhism), where "mindstream" (sems-rgyud) may be understood as a stream of succeeding moments, within a lifetime, but also in-between lifetimes. The 14th Dalai Lama holds it to be a continuum of consciousness, extending over succeeding lifetimes, though without a self or soul. ↑ Karunamuni N.D. (May 2015). "The Five-Aggregate Model of the Mind" (PDF). SAGE open. 5 (2). doi:10.1177/2158244015583860. ↑ Kyimo 2007, p. 118. ↑ Panjvani 2013, p. 181. ↑ Lusthaus 2014, p. 7. ↑ Source: (accessed: Wednesday 28 October 2009). There is an English translation of this work by Gupta (1969: pp.81-121) which is a rendering of Stcherbatsky's work from the Russian: Gupta, Harish C. (1969). Papers of Th. Stcherbatsky. Calcutta: Indian Studies Past and Present. (translated from Russian by Harish C. Gupta).